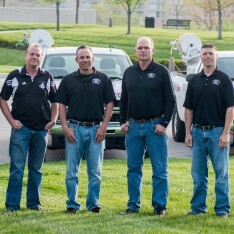 Our goal is to provide you with the highest quality lawn and tree care available in the greater Kansas City area. Martz Bros. Lawn & Tree Care is family-owned and operated business that serves both residential and commercial customers. We offer lawn, tree and pest control, as well as seeding services. Unlike other companies, we focus specifically on the Kansas City area. Our goal is not to be the biggest but the best! For a Free Estimate from your State-Certified Technician, contact us today ONLINE or at (913)789-9333. We look forward to discussing your vision for your outdoor environment. Contact us today to schedule your FREE Estimate with Lawn and Tree Analysis! The Same State-Certified Professional will oversee your Lawn & Trees. I was on the patio last night grilling and chilling, when I noticed the backyard. It has never looked better. Last year I had large bare areas and lots of weeds. I give you credit for a complete turn-around. Thanks for the good work, and I will pass it on to my friends. Thanks guys! We have used you for many years and get many lawn compliments. Martz Bros. is a local, family-owned and operated company. 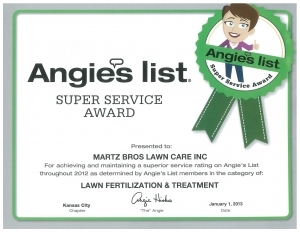 We have been providing high-quality lawn care and service in the Kansas City area since 1995. Martz Bros. Inc. began building a reputation for delivering the highest quality customer service standards in 1995. Our people are what makes the difference. Looking for the convenience of paying your invoice online? Start spending less time dealing with bills and more time relaxing outdoors!